My strong recommendation to all involved is to be sure that your teaparty effort stays grassroots and nonpartisan. We need to cut government and taxes big time and get back to our constitutional roots. Many would like to co-opt the movement and call it their own, but no one owns us! I am working with a group of concerned citizens around the country and want to guide you to a couple of tiny little grassroots efforts with huge implications. Please visit Constitutional Liberty Coalition on wordpress and also on facebook to find other state leaders committed to the same goals. We formed as a group when we saw top down techniques being used in what we thought was a collaborative effort. Then we did the research and found that globalist Newt Gingrich was being promoted as our leader and web pages directing shared lists and fundraising around his organization. We purposed to not drive traffic to the national website for that reason and will do everything in our power to keep the movement safe in local hands. But you will have to be vigilant and help. Groups are welcome to help and promote to their own lists and attend and participate. Glenn Beck is now promoting the movement as well, but he is not asking for your lists and money and is to be commended for that. We hope that continues! Another page is on facebook in draft format if you want to create a state page separate from the list in CLC above you are invited to see Taxcut Teaparty (Draft at present) on facebook or create your own. We are happy to help any way we can and fully supportive of your efforts for the people to have a voice! Another resource for you is a grassroots primer that I helped with, but Shelli Dawdy took to finished format. Please read and study Grassroots 101 and share with everyone you know with questions about matters at hand! Whether you’ve never heard of the site, are aware of in passing, briefly visited, or have even gone as far as to register but still can’t figure out why Twitter is “a big deal” then this information is for you. At the very least, it’s a fun way to communicate with other people around the world. More important, it is a potentially important and powerful tool if you are in business, politics, or charitable causes. In politics, Twitter has been and is being used by people to discuss issues, share information, spurn activism, communicate about organizing and provide a venue for advertising events. A Twitter based group, TCOT, was the key organizing entity of the February 27 Nationwide Chicago Tea Party that resulted in tens of thousands of people in over 45 cities convening simultaneous events. So it isn’t an overstatement to declare; Twitter is a must have weapon in the political activist arsenal. Twitter is a form of social media. Admittedly, it can be difficult to explain to the newcomer. The reason being, Twitter is exactly what you chose to make it. For the unfamiliar, social media are internet and mobile phone based technologies that are intended to provide fast, interactive communications. Many forms of social media have been around for a long time such as e-mail, chat rooms, forums, and photo-sharing sites. Other forms have developed such as My Space, Facebook, and blogs. The number of Twitter users is growing exponentially. In April of 2008, the average number of unique monthly visitors was 1.1 million. A report at the end of February 2009 showed the average number of unique U.S. visitors had swelled to 8 million. The number of visitors to the site had been steadily increasing over the course of those ten months, but began to spike up sharply starting in December. The rising number of visitors is likely due to an increasing amount of media attention to the site. Just do a Google news search on the term “Twitter” and see how many stories are cropping up. The term “micro-blogging ” evolved because the length of a message sent out is limited to 140 characters or less. In other words, whatever it is that you have to “say”, brevity is the soul of wit. People use Twitter for a host of reasons, from personal communications such as letting family know that their plane has just arrived at the airport, to a business sending out tips about its products as part of an overall marketing strategy, to messages sent out by a member of Congress from the floor of the House during President Obama’s recent address to a joint session of Congress to give his fellow Americans a “feel” for the experience. With the volume of information possible, one would think the number of messages would be overwhelming. But that is the beauty of Twitter. As noted, Twitter is what the user makes it. So, you ask, how can that be? Twitter is structured in a such a way with its many features that you can chose how and with whom you interact. If you look at the typical home page of a Twitter user, you will see a list of items in the right column. Those items, in addition to other Twitter features, allow the user to control their own Twitter experience. In order for those features to be more easily understood, the best way is to begin looking at the Twitter structure on the site itself. To get started, one first needs to be registered as a Twitter user. The registration process is very easy and it’s free. The registration page is fairly self-explanatory and quite easy. The only notes for this page pertain to the first and last name and the Username you will choose. Keep in mind that the first and last name you list will be publicly visible on your Twitter profile. If you are not comfortable with having your real name available to the public, you can use something else. Some people, for example, list only their first name, while others split their username into two parts, and others make a variation on the username. Again, making these choices allows you to control your Twitter experience. After filling out the registration page, you are given an opportunity to search through any Gmail, Yahoo, AOL, MSN, or Hotmail email accounts you have for contacts who are already using Twitter, so that you can get connected with them right away. In a couple of tests, the application didn’t reliably find a few of the email contacts in an address list who are known users of Twitter, but clearly this application must rely on the fact that the person listed in your email list must be registered under that particular address. Someone you know might be on Twitter, registered under a different email account, so they won’t show up in this search, but at least it’s worth a shot. If you’re looking to connect with some of your friends or associates, don’t worry, there are other ways of finding them. The default action of this application is to send you to the next step in the process. However, if you have multiple email accounts on several of the services listed above, you can simply hit the “back” button on your browser to try more than one of these searches. Whether or not you find any of your contacts, you will ultimately land on a page that pulls a brief random list of Twitter users whom you could elect to immediately begin following. On a couple of test runs, a very diverse list of users came up, including celebrities, news agencies, and so on. Whether or not you choose to follow anyone on the random list, you click the “Finish” button, and ultimately will be taken to your very own personal Twitter Home Page. Notice next to the user name, there is a box that says “Add a Photo”. You will be taken to a page with an option that says “Browse” where you can search your computer for a suitable image as an avatar. Note that you may need to crop an image, or experiment a few times with different images to get the look you are after. Also note on this page, there will be a list of tips for choosing photos. Once your image is loaded, you click “save”. Note that tips from Twitter’s creators appear in a sidebar on the right hand side of the page for each of these areas and are worth reading. Account: Includes the information you already typed in at registration and the following options: time zone, a space to include a link to a website, 160 character biography, location, and the option to protect your updates. Updates will be explained shortly. Important! The content of your profile will tell other people whether or not they will follow you. Are you going to be using Twitter for a very specific purpose or do you want to interact with a wide variety of people on a variety of subjects? This should be taken into account when writing your profile. Password: Ability to change password by entering old, then new. Devices: As noted above, Twitter is a social media. In addition to its internet interface, the option exists to use with a mobile phone. You can enter your number and receive updates from your Twitter id. As noted on the page, if you opt to have updates sent to your phone, any charges associated with receiving text messages are based on your particular mobile plan. Obviously, if you’re going to be using Twitter a lot and acquire a large number of followers, you’re going to want that shiny unlimited text messaging plan from you cell service provider. Notices: Pertains to your preferences regarding receiving emails from Twitter each time you receive particular kind of messages to your Twitter id. You may want to leave the defaults on these areas at first, until you get the hang of things. Picture is the default item that shows up when you land on this page and has already been covered. Note that you are not limited to the options provided by Twitter here, although there are some nice choices. You can click on “Change background image” and upload a photo. Smaller photos can be tiled so as to provide a fully covering background. There are Twitter users who have custom designed a background to include a list of their contact information and or that promotes their business, etc. In addition to customizing the background, you can also change the color scheme. This will affect the color of the right hand column where all of the buttons are listed. Options include changing the font for basic and link text as well. Messages (noted by Twitter as “updates”) are called “Tweets”. The word tweet is both a noun and a verb: “I sent out a tweet” or “I tweeted about that today”. Following: People who interest you, whose Tweets you would like to read, and with whom you’d like to interact. Updates: The number of Tweets you’ve sent out, ever. There is a list of items on the right hand side of the page, which include many of those features earlier mentioned that help Twitter users shape their own experience. What are all these items? Home: This is the overall stream of tweets from all of the people whom you are following. Direct Messages: The common vernacular is a “DM” and these tweets are seen by the sender and receiver only. This feature is nice for sending contact information such as your email address, if you decide to increase the amount of communication with a fellow Twitter user. Favorites: Tweets a user has decided to save for future reference. How can these features be used to shape the Twitter experience? As noted, it’s up to you how you will chose to use Twitter. You could start tweeting out messages into “Twitterland” and likely, some people will opt to follow you. Without some additional knowledge or strategy, though, you may find yourself dissatisfied with the entire experience. To get an idea of how hard it would be to “be heard” by anyone, though, just click on that “Everyone” option. You can enter any word or phrase into the search box you wish, then click the “Search” button. This is one way to pull up information. You will learn “Search” is the fastest way to find a stream of tweets from a particular user once you have so many followers, scrolling backwards through your home page stream is far too time consuming. Screenshot #13: Twitter Example Search term - "politics"
You will see a lot of tweets on a subject like this, with pages and pages of Twitter search results. You may find some interesting information by doing this. However, if you want to narrow your search and more readily find whatever it is you are looking for, the most effective searches involve a key Twitter feature – the hashtag. “Hashtags are a community-driven convention for adding additional context and metadata to your tweets. They’re like tags on Flickr, only added inline to your post. You create a hashtag simply by prefixing a word with a hash symbol: #hashtag. So hashtags make for more effective searches. You will note if you put the “#” symbol in front of your search term, your search will reveal people who have not just randomly mentioned the word in their tweet which formed the basis of your search, but they purposefully placed a hashtag in their tweet, intending to communicate with others on Twitter who are interested in that subject. Notice on the Search page above, the most popular search terms at the moment the page loaded are listed, note many of the terms include hashtags. Also note on the sidebar of an opened Twitter search (see above) lists the “Trending topics”, indicating the most popularly used terms in Tweets at the time the Search page was loaded. The example search listed for #politics is still quite broad. More subject specific hashtags, particularly for “communities” and groups on Twitter have developed. In politics, the two most widely used hashtags are #tcot and #topprog. 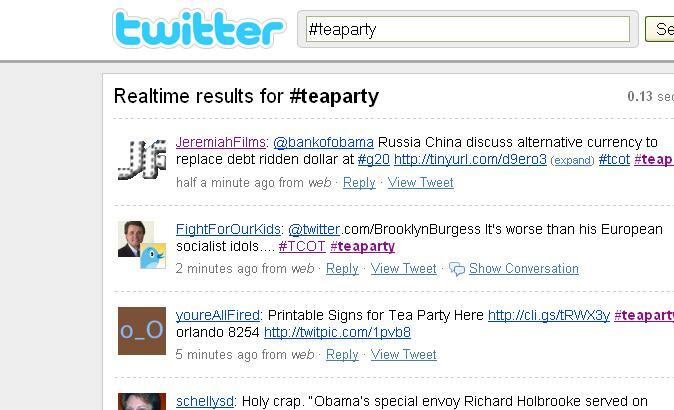 Of course recently, the most popular politics-related hashtag is #teaparty. It has periodically appeared among the top three trending hashtags on the site. Although our political focus here is obvious, popular culture hashtags trend at times. During the airing of an epidsode of American Idol, the hashtag #idol or #americanidol often appear on Twitter’s Trending topics list. The “Whole Lot of Nothing” blog has a “Beginner’s Guide to Using Hashtags on Twitter” post that you may find helpful. You can see how Twitter can be used as an effective communications tool within particular groups using the hashtag feature. Once you’ve discovered how to search effectively and how hashtags can be used, you can use these tools to being focusing on people who you may wish to follow. How do you follow people? I can read through these tweets to see if I have found some comments that pique my interest. I may want to follow those people and I may even want to engage them in a conversation about their tweets. The user “Cody_ Kessler” has tweeted out a link (more on that later) to a story about Gov. Sarah Palin’s use of the Stimulus Bill funds in Alaska. She has also used a lot of #hashtags, including the #topprog tag mentioned earlier. If I find her tweet compelling, I may want to follow her. Notice that her Twitter ID is circled in orange. Another user, “dougjumper” mentions the E! TV network’s Soup show and it’s coverage of Pres. Obama’s March 19 appearance on The Tonight Show with Jay Leno. I might find this whole tweet compelling because I occasionally watch both TV shows mentioned and/or I’d heard some news about it. Clearly, “dougjumper” and I have some common interests. If you want to follow someone, all you have to do is click on their Twitter ID, which is always listed right after the avatar and right before the tweet. Of course, you have to use your own criteria for whether or not you wish to follow someone. I can only tell you what mine is to give an example. Focusing on the issue of whether I want to follow someone whose tweets have piqued my interest, all I’m looking for, frankly, is that the person does not use vulgar or crass language regularly or engage in abusive messaging to others. How can I tell? I can read their stream of tweets, which are visible in the wide left column in the screenshot above. I can scroll down the page, and even look as far back in their history as I want, to as far back as Twitter stores. To the best of my knowledge, as of right now, that means from the beginning of a Twitter user’s registration. If you decide, based on whatever criteria you’ve established, to follow someone, all you have to do is click that “Follow” button under their avatar. Their tweets will now appear on your Home page stream, as explained in Screenshot #5. Besides the searches mentioned, you could decide to look through the “Followers” and “Following” lists of other Twitter users and examine their profile pages, as mentioned above, and decide to follow them as well. To check through those lists, all you have to do is click on “following” or “followers” under the number in someone’s profile. One handy way of checking someone’s following list is to click on the avatars under “Following” in the right hand colum, which is the last item. By clicking on any avatar, you will be taken to that particular Twitter user’s public page. There are some tools, outside of Twitter, that can help you “zero in” on people to follow. I know I haven’t even begun to discover them all, and if you aware of any, please, leave a comment under this post. I will add these additional tips given by readers, within this post and credit the person telling me about them. (As I have time, of course.) The tool I like the best so far is TweetGrader. You can check your own “grade” by entering your Twitter ID in the box, then click the “Grade” button. Since we’re focused here on finding people to follow, I’m not going to spend time focusing on the criteria for the “grade”. After entering your own id, you will be taken to a page that lists your grade and overall rank out of all registered Twitter users in the U.S., but more interestingly, really, is that you can see the “Twitter Elite” in your own state, which is comprised of the 50 Twitter users with the highest “grades”. You may want to follow some of those people. You can also see the list of “Twitter Elite” in the U.S. overall, which are the 100 people in the U.S. with the highest grade. The bottom line is, once you get started on Twitter, and by following some of the additional tips to come, you will being having no trouble finding people to follow. Try to keep your follower / following ratio as equal as possible. When someone opts to follow you, send them a DM thanking them and say something personal you noted about their picture, background, bio, or one of the tweets in their stream. If you take the time to periodically do this as you are following people back, you may be surprised how much people appreciate this. Many people on Twitter do not take this step at all and others use automated programs to send a DM when they have been followed by someone. People generally find those auto DM’s annoying. (I know I do.) It is the hallmark of a Twitter user who is out for self-promotion. Simply sending out tweets regularly is not going to make for a very enjoyable Twitter experience. It is supposed to be interactive. Using searches and noting people’s tweets by making some remark in reply or asking a question engages you in dialogue with others. Depending upon your number of tweets per day, you may have responded to someone or they you, hours ago, and some context is required to re-engage with that user. If your diaglogue is immediate, no need to refresh the person’s memory. But say you are responding to a tweet from someone’s tweet hours after it went into the stream. You need to mention in a word or two, the subject you’re addressing. It can be confusing, and sometimes amusing, when replying a bit later to someone’s tweet. Just try to be clear. Note that it was recommended to keep the follower / following ration as equal as possible. Why? As has been mentioned a number of times, Twitter is a tool that was meant to be interactive. You will have little success or interest on Twitter, ultimately, unless you are some kind of “rock star” celebrity-type, if you don’t return the kindness and follow people back who have opted to follow you. I am of the humble opinion that many of the rock stars will ultimately fail to keep people’s interest on Twitter unless they follow people back and ultimately engage. As with any “community” , socially acceptable norms develop. On Twitter, the developing consensus seems to be that it is not a place for pure self-promotion. Engagement = required. People will stop following you if you do not follow them back. If you follow the practice of attempting to keep the ratio equal, you will only continue to get more new followers. Something that may not have yet occurred to you as you are reading this is that there is a second-tier effect of all of your own tweets and those of others (see more below). But how do you determine whether you fill follow someone back? My personal criteria for this is slightly different than when I have purposefully looked at tweets and have been piqued by something another user said. I’m already hooked, as it were. When someone has chosen to seek me out, that is a bit different. You should check as often as possible for new followers and determine “yay” or “nay” on returning that kindness. You can do that by clicking on “Followers” on your home page, under the total number you’ve acquired to date. If you want to reply or say something to another Twitter user over the public stream, you put the “@” sign in front of their Twitter id. If someone wants to “tweet” to you, they do the same. In Screenshot #18, you see that Twitter user AlaskaArtist tweeted the comment “You r awesome, many thanks for the RT! !” at / to fellow Twitter users donnieatmon and donnaeastern. Notice when the @sign is put directly in front of someone’s userid, their name turns blue. The userid is now clickable. This allows anyone reading the public stream to click on that userid. As mentioned earlier, clicking on the id will lead to the Twitter user’s profile. To review: A Twitter user’s id is clickable when they are the “tweeter” or when the @ symbol is placed directly in front of it (no space). Besides being a handy way for Twitter users to follow a fellow user they find interesting, the @reply is powerful in several ways. Even if you are not personally following a particular Twitter, you can tweet to them, simply by putting that symbol in front of their id. The other powerful aspect of the @reply is the second tier of followers. Looking again at Screenshot #18, say you are following AlaskaArtist, but you are not following donnieeatmon. If donnieeatmon appears in AlaskaArist’s tweet stream, and the conversation seems interesting to you, donnieeatmon is now “on your radar”. You can click on his userid, look at his profile, and choose to follow him if you wish. So whenever your names appears in one of your followers tweet stream, all of their followers see your id and the one side of the “conversation”. You will notice that you pick up new followers (unless you are extremely repugnant in your discourse) that you will pick up new followers almost every time you have a “conversation” with another user. This feature allows you to communicate privately with other Twitter users who follow you. You can discuss things you don’t want seen in the public stream and exchange contact information with one another. In order to send someone a Direct Message, the person does needs to be following you. It has become Twitter tradition for many users to tweet out a list of some of their favorite fellow Twitterers. This is done by listing the #hashtag “#followfriday” and including a list of Twitter users you are recommending others should follow. This is done just like an @ reply. As noted above, userids are clickable. When people see your #followfriday list, many will take your recommendation. Besides tweeting your thoughts and dialoguing with others, you can share links with other Twitter users. You can cut and paste links right into the Twitter text box. As we all know, some links can be quite long and Twitter does have the character length restriction. You can make your link shorter by turning it into a “tiny url”. Just click here. Once the program has shortened the link, you can cut and paste write into the Twitter text box. If you have a Flickr, Photobucket, or other photo-sharing account somewhere on the internet, you can post links to those photos the way you would any other. Besides sharing basic links, you can share pictures with your fellow Twitter users. Every Twitter account automatically has a TwitPic account assigned. You log into TwitPic with your Twitter id and password. The great thing about TwitPic is that if you do not have online photo space, you can upload photos directly there and tweet them out, all in one place. With the advent of the #hashtag, Twitter added the Tweet Chat feature. It allows users to view tweets from one #hashtag only. It has more power than just screening, though. By devising a unique #hashtag, you can create your own chatroom of sorts. Be advised, the tweets are still viewable by the public, this just helps you “weed” all others out. It is better than a simple search, which is really past-tense. Tweetchat scrolls new tweets with the specified in real time. Beyond weeding out tweets and sort of creating a private chat, you can use Tweet Chat as a meeting place, as a broadcasting point for an event, and as rather a secretary during a conference call, just to name a few ideas. Perhaps everyone you’re working with is on Twitter, but they don’t all use Skype or Instant Message program. Instead of having to send each person you’re having a conference call with a separate email with links, you could run TweetChat simultaneous to the call, tweeting out links as they come up in conversation. To use this feature, go to Tweetchat.com and log in using your Twitter id. You will prompted to enter the #hashtag you wish to follow, which is labeled as “a room”. Remember, you can create any #hashtag you want. 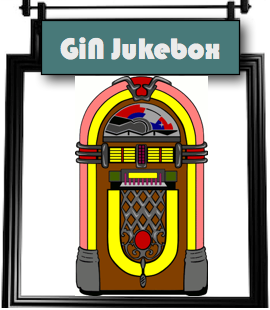 In addition to your thoughts, links, and photos, you can share your favorite music with your followers. Blip.fm is yet another tool for Twitter users. In a few minutes, you can set up your Twitter id with Blip. Then you’re ready to search for songs. Once you’ve found the song you want to share, you click the “blip” link and a text box appears. You can add a message to the tweet before “blipping” the song out on Twitter. *Warning* this activity can be addictive. This is a totally web-based tool, no downloading required, which allows you to choose from multiple grid formats all at one time. You can have a grid of 1 row x 1 column (smallest) all the way to a 3 x 3 grid. The user enters a search term in each section of the grid, and Tweet Grid refreshes it as new tweets are sent out. With a 3 x 3 grid, you can be watching a scroll based on a combination of six different search terms and hash tags, all at once. Tweet Grid works fairly well, but it does occasionally stop refreshing. Also, as it is in a browser window, I find it a bit inconvenient. In order to see what’s going on, you have to keep a separate window open or jump back and forth the tab you have running for it. For me, Tweet Grid is a back-up when I’m away from home. Once you begin to get a lot of followers, it’s very hard to keep track of the public feed and see more than a few people’s treats using the basic web interface. It’s very easy to lose track of people this way. The program TweetDeck allows for columns somewhat like Tweet Grid. The default number is three and loads the stream “All friends”, “Direct Messages”, and “Replies”. Depending upon your monitor settings, you can see up to six tweets at one time in each of those three columns. But there doesn’t seem to be a limit to the number of columns you can add on by using the “Search” feature. (I’ve had as many as eight at one time.) You set up a search column for a particular #hashtag (or tags, plural), for a particular Twitter user or users, or for a search word (no #hashtag). If you have a large number of followers, this allows you to watch the running “All Friends” feed, but also to set up a search to watch certain friends more closely. If there is a an exciting or trending #hashtag, such as #teaparty, you can set a column specifically to search for all of those tweets. Obviously, there is a limit to how many columns will be immediately viewable at any given moment. The slider bar allows you to run back and forth across “the Deck”, to look at the most recent tweets in any of those columns. One of the things that sets TweetDeck apart from using the Twitter web interface or the online based Tweet Grid, is the little notification box that pops up letting you know when new tweets come through in any of the columns you’ve got running. You can be doing whatever else you want to on your computer and know what kinds of tweets are coming through and how many. The default settings for the program include a little “alert” sound everytime one of the columns is updated. Of course, some people say they find the alert sound annoying. If it weren’t for the notification box and alert tone, I’d not necessarily know I’d received an @reply or DM. I tend to get a little hyperfocused when I’m working things. But you can turn the sound off if you find it bothersome. Besides the ability to customize who, what, and how many parts of Twitter you would like to keep an eye on, there a few extras on the Deck that make your tweeting more efficient like the automatic shortening of links, a TwitPic button, and easily accessible tool bars. The settings feature allows you to customize the deck’s appearance; you can choose the overall color, text, links, etc. @Replies, Direct Messages, and RTs (retweets) are made very simple by the buttons that appear when hovering the mouse over the avatar of each Twitter user. After you’ve used TweetDeck for a time, you wonder how you ever used Twitter without it. TweetDeck has become Twitter for me. But TweetDeck is in beta release, which means it may have a few problems here or there – or it might not. As with any Beta program, the bugs are still being worked out. The most notable bug comes by default. But the good news is, it is easily corrected. If you’re going to try TweetDeck, it is essential that you go immediately to the “Settings menu” (found by clicking the little icon of the wrench) and change the API settings. The defaults are so poor in fact, I had to stop using TweetDeck altogether at one point with my P4. The program seemed to be locking up my whole system. Admittedly, that box was on its way to death’s door (the motherboard ultimately went out.) Having said that however, many people have reported the same problem and many people are still using P4 systems. All Friends 30% 2 min. In my opinion, the only other thing about TweetDeck that needs to be fixed is where on your screen the notification box pops up. It is set to land right in the upper right hand corner of your screen. For those of us with Firefox’s search box installed, it can be very annoying. The box sits still for a very short period during which you are blocked from entering a search term. For people who very frequently do research it can be maddening at times. You’ll be in the middle of typing in a search term when the box pops up, obscuring your text. TweetDeck is standalone program requiring download (free). In order for it to run, you must also install Adobe Air. Download and and install are easy and well-explained by the programmer. This post started out with the notion that Twitter is whatever you choose to make it. With its many features and available “extensions”, you can keep things as simple as jumping on the web interface occasionally or going for the whole experience by downloading TweetDeck. For the politically involved, Twitter is a valuable resource. Quick, simple communications that can convey a lot of information and a chance to network with people across the country.